This package provides several ImageJ routines to characterize surfaces. The plugins can be used with any topographical image acquired with e.g. laser profilometer, white light interferometer, AFM etc. The input is a 32 bit image or stack in which the pixel values represent distance, z, to a surface. The user also needs to provide the transverse spacing between the pixels, expressed in the same units as the range data. 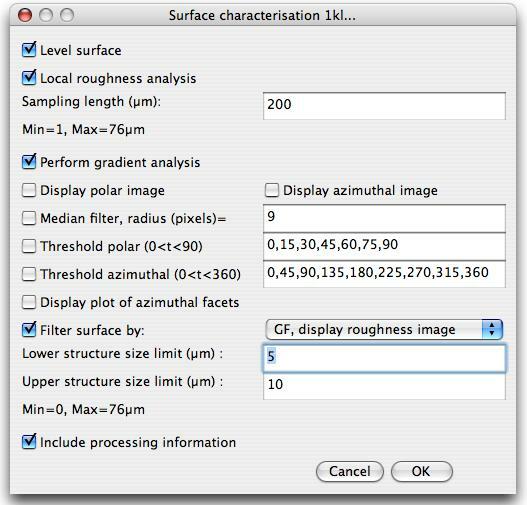 ImageJ plugins are developed to level and assess surface roughness statistics including root mean square deviation, skewness and kurtosis. 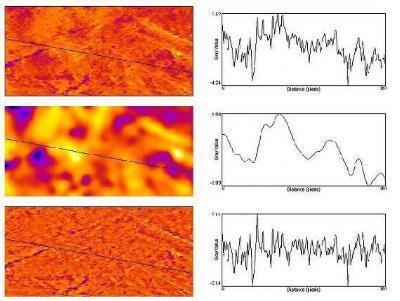 Gaussian filtering is used to separate the waviness from the roughness and thus assess the structure at different wavelengths. A plugin for detecting the local facet orientation using Sobel operators is also available. The image labels are added to the result table. 2003/11/24 The Gaussian radius has been adjusted to half the lStruct value. 2004/03/15 Added option to display polar plot of azimuthal images. This plot gives the main direction of the azimuthal facets. 2005/03/26 Roughness statistics modified, no 0-level requirement. 2006/01/20 Computes the surface area based on a suggestion given by Bob Dougherty, optinav.com. 2007/10/09 Minor changes to the code. SA is divided with the project area. 080507 Limit the upper structure size to a 1/4 of the image size.(1q). Chinga, G., Johnssen, P.O., Dougherty, R, Lunden-Berli, E. and Walter, J.: “Quantification of the 3-D micro-structure of SC surfaces". J. Microscopy 227(3): 254-265 (2007). Check this option to enable the Sampling length text field. The roughness statistics are thus assessed on local regions according to the given Sampling length. The final reported roughness values are the average of all the roughness values on the local sub-images. MRV: Mean resultant vector (See also Curray, J.R.: "The analysis of two dimensional orientation data" J. Geol. 64 : 117-131 (1956) ). SA: Surface area, given in calibrated units. Check the Display polar image and Display azimuthal image to visualize the decomposed images. Performs a domain segmentation by median filtering the images. The Median filter radius defines the size of the domains. Each pixel within the domain is replaced by the corresponding median value in that domain. The images can be thresholded to quantify the area fraction (%) within each class for the polar and the azimuthal images. The area fraction are calculated and presented in the result table corresponding to the polar images (X1-X2p) and the azimuthal images (Y1-Y1a), where X1-X2p and Y1-Y2a correspond to the size classes defined in the Threshold polar and Threshold azimuthal fields. A polar plot may also be generated by checking the Display Plot of azimuthal images giving also the main direction of the facets. FILTER SURFACE: Check the Filter surface by: to filter the surface prior to R-values calculattion. One may choose between two filtering routines built in in ImageJ, Gaussian filtering (GF) and FFT bandpass. GF, Display roughness image, filter the original image with a Gaussian filter having a radius corresponding to the Lower structure size limit input. The image is then separated into a roughness and a waviness component. The roughness image is given and the R-values calculated. GF, Display waviness image, filter the original image with a Gaussian filter having a radius corresponding to the Lower structure size limit input. The image is then separated into a roughness and a waviness component. The waviness image is given and the R-values calculated. FFT, Display bandpass image, uses the native IJ/Process/FFT/Bandpass... to filter the original image. The resulting filtered image depicts the structures between the Lower structure size limit and the Upper structure size limit. R-values are calculated on the filtered images. Note the surface statistics are based on the complete image, including the edges, even after filtering. INCLUDE PROCESSING INFORMATION opens a text having information about e.g. the filter used, step size, threshold etc. PROCESS ENTIRE STACK process all the images in the stack, otherwise only the current slice is processed.